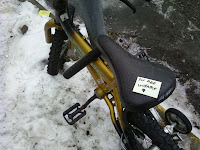 Three years ago February 14th was two days before my grandpa died. I knew it was coming. By that point he couldn't eat solid food... actually, he could barely eat any food. I made him an origami elephant as a Valentine. It took me forever. By the time I was done I had folded and unfolded the paper in so many ways, the paper was worn at the edges. I moved in with grandparents on my dad's side when I was seven years old. I grew up with my grandpa. In a lot of ways he was like my dad. I watched tv with him everyday- The Fugitive, The Rockford Files, The Avengers... He watched me grow up. He said, "An elephant never forgets." So, I gave him an elephant so he would know I would never forget the various bumps and folds of the past throughout the various bumps and folds of the future. Then trust it is found at exactly the right moment by the perfect person." 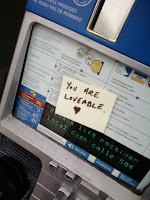 Obligingly, I grabbed my Post-It notes and Sharpie marker and headed out into the cold late afternoon of this Valentine's Day. 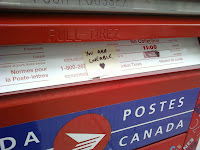 I wrote down messages of 'you are loveable' and placed them on benches and bus stops, subway entrances and mailboxes, little-tyke bikes and phone booths. I thought about all the people I know going through a rough time this season. I thought about the various times I had been made to feel totally unloveable growing up. And then I thought about the time that I went over to my parents house to keep my grandpa company as he was sick. I fell asleep beside him and when I woke up I caught him watching me as I slept. I remember thinking 'this is your gift to me'- to make me realize I am wanted and needed and absolutely loveable. I merely passed on the sentiment today and I hope that someone else who needs it now does find it at exactly the right moment. Ps- I should mention that I was introduced to this fabulous idea by my twitter friend @chronicbabe, who can also be found at ChronicBabe.com.